Some of you may have wondered why I was MIA the last week but I was one of those lucky ones who was able to enjoy a long weekend with friends and family. Needless to say, this has caused us to be a little late with posting our weekly blog. I was able to make my way up to Minnesota for the first time and enjoyed spending a few days fishing and being on the lake with new found friends and family. I also enjoyed driving the countryside and seeing many beautiful small farms along the way to and from the airport. I could not help but wonder how many of those farms were growing crops or feed we would eventually consume. It was interesting to see how different the farms were from where I now live in Texas, but also in some ways, how similar they are. I was able to tour Maplewood State Park near Pelican Rapids. As I was hiking up to Hallaway Hill with friends, Ron and Alex at the park, I could not help but reminisce about our forefathers and all they had to endure when that park was once a working farm prior to the 1960’s when it became a State Park. The park has rolling hills with some wooded acreage and some open prairie and as we meandered down Hallaway Hill, Ron, my German tour guide and native Minnesotan proceeded to share his story of when he grew up on his small Minnesota farm as a young boy. He told me how many of the farms where he grew up were dairy farms and included some swine farms as well. Actually, the farms around where he grew up raised just about anything you could think of such as pigs, chickens, goats, sheep, etc. He proceeded to tell me that now there are less dairies but the few that are left, are milking more cows. Those kinds of stories are priceless, and in some ways sad, but nonetheless, should be captured by those fortunate to learn from experienced and seasoned friends. During our trek up and down Hallaway Hill, he shared his rangeland expertise as well, which is something I am lacking at this point. I remember studying the different types of grass when in high school and some classes in college, but that was a long time ago. He pointed out the different types of grass such as June Grass, Quack Grass, Wild Oats, and even legumes such as alfalfa. We even spotted some red clover. I am sure those were only a small sampling of what can actually be found on the 9,200 acre park, but it was enough to appreciate his knowledge and history of the place. I almost forgot to mention…for the first time in my life, I actually saw a Bald Eagle in free flight out in its natural habitat. Had I been prepared, I could have snapped a picture, but true to form, they are stealth fliers. He gracefully approached us from behind and before I knew it, all I would have been able to capture would have been his white tail feathers. Instead, I just appreciated the beauty of our National Symbol in flight. It was awesome how close he flew above us. Being a horse lover and avid roper, I appreciated Ron showing me the park’s horse trails. I had never seen nicer facilities at a state park, but as we were leaving the park, there were horse trailer after horse trailer going into the park. It was a clear sign that the park was a big supporter of the equine method of mobility and the facilities are used quite extensively. 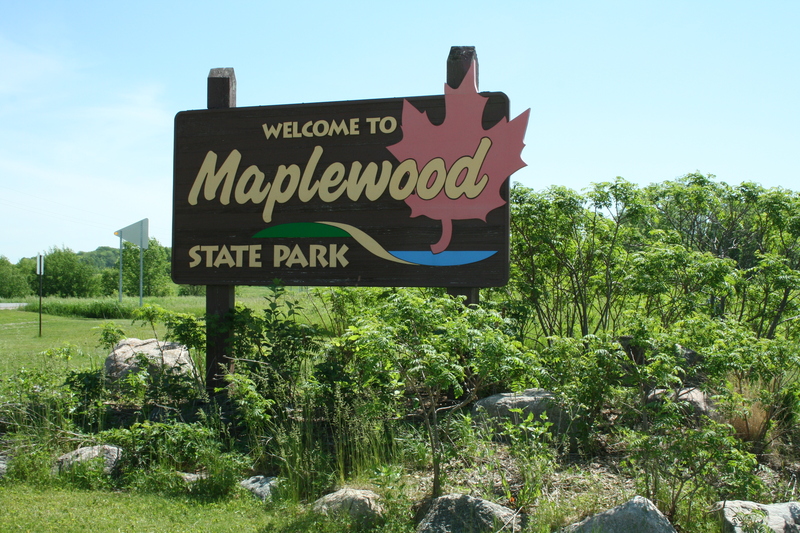 As we were driving away from the park, I could not help but think about the many careers that are involved in running such a place like a State Park like Maplewood. I imagine it takes quite a bit of different people with a variety of degrees. I would assume many of the positions at the park would involve people who have received their degrees from colleges of agriculture or natural resources. There are many careers and majors that come to mind such as range science, rangeland management, equine science, animal science, natural resource management, wildlife, fisheries sciences, agronomy, soil science, crop science, recreation park and tourism sciences, ecology, bioenvironmental sciences, ecological restoration, environmental studies, and horticulture, to name a few. Next time you have an opportunity to tour a park, farm, or ranch, keep in mind the many majors that can be studied to carryout an effective business in agriculture or ventures tied to agriculture such as the State Park I toured that once was a working farm, but is now used for our enjoyment. There are many career opportunities and usually not enough students to fill the vacancies. Oh yeah, I almost forgot one more career or major that can be added to the list above. A tour guide!